Of course you are frustrated for your son! It sounds like he is struggling for many reasons. However, I want to assure you there are multiple things you can do help him, even though you aren’t with him at school. If your son does not have an Individualized Educational Plan (IEP) or some modifications in place to support him in the classroom, talk to the guidance counselor or his teacher about how to initiate that process. Not every child who struggles at school will qualify for support services, but an assessment by specialists who are part of that educational team may help everyone to understand what types of supports he needs most. If your son already has an IEP, consider setting up a team meeting. Some parents don’t realize that they can request a meeting with his team at any time. It may not happen right away, but parents can initiate and guide the IEP process. Be a strong advocate and communicate with the education team. Working with your son’s educational team can make a big difference. Here is a link to an online resource that gives information about special education services and how to advocate for services in school: http://www.specialeducationadvisor.com/. Some ways to facilitate good two-way communication include the exchange of short video clips, use of a daily communication notebook, use of an online google doc, a weekly email exchange or a brief bi-weekly phone call. Pinterest can be a great resource if you want samples of communication logs: https://www.pinterest.com/TheBigAWord/autism-parentstudentteacher-communication/?lp=true and here is a link to a video that gives suggestions for communicating with schools: http://raisingchildren.net.au/articles/asd_communicating_high_school_video.html/context/1366. Consider private occupational therapy (OT). OT outside the classroom may help your son gain skills that are relevant to his classroom work. 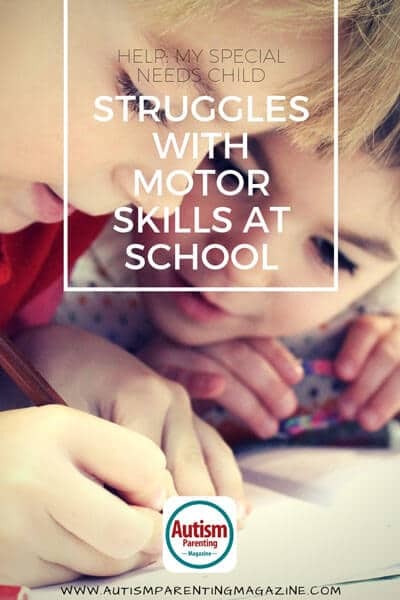 It is possible that many of his struggles (trunk weakness, impaired fine motor skills, and poor eye-hand coordination) are all be part of the same larger category of challenges known as Sensory-based Movement Disorder. Here is an online resource that explains what that is: https://www.spdstar.org/sites/default/files/publications/3.%20Jul.-Aug.%202012%20-%20SBMD%2C%20PD_0.pdf. I suggest finding a private practice OT who specializes in sensory processing. A therapist with advanced training in sensory processing will be able to help your son with all of the challenges you mention. Modify HOW he does written work at home. 1. Doing written work while lying on his stomach; this position puts his hands and body in a more supported position, and the input he gets from lying like this could help him feel less frustrated. 2. Doing smaller amounts at one time, e. do one line then stretch hands and fingers, maybe have him get up and move for a minute (do a lap or two around the table) then sit back down for another line; breaking difficult tasks into smaller chunks might make it less overwhelming. 3. Writing the first word (or two or three…whatever seems like a just-right challenge for him…don’t make it too easy but don’t make it too hard) and you finish the rest of the sentence. 4. Requesting homework assignments that require less writing but still teach the main lessons or concepts, e., multiple choice assignments, word finds with vocabulary or key words, coloring words or pictures related to the lesson, hidden pictures, hands-on projects, use of word banks, etc. 5. Using a letter guide: https://www.google.com/search?q=handwriting+without+tears+letter+strip&client=safari&rls=en&tbm=isch&tbo=u&source=univ&sa=X&ved=0ahUKEwjksbSP963ZAhUBMd8KHTGKACoQsAQILw&biw=1379&bih=812 so that he can see the letters as he is trying to write. This will decrease his need to come up with what that letter looks like in his own head, as he is writing. 6. Teach him to type and practice keyboarding every day. Keyboarding Without Tears is a program that helps children of any age or ability master keyboarding skills: https://www.lwtears.com/kwt. Daily practice is important and there are free typing games on the computer that some kids love: freetypinggame.net. Consider using Google Docs to turn worksheets into forms he can type on for completing homework: http://carriebaughcum.com/making-worksheets-pdfs-typeable-using-google-draw/. 7. Play games to help with eye-hand coordination: tic-tac-toe, SOS, dot-to-dots, hidden pictures, balloon volley, pool noodle baseball, bean bag toss, wall-ball, following a path (painters tape letters), block building and following Lego patterns. Have realistic expectations. Remember he will continue to struggle. Having supports in place and doing everything “right,” might not take that away. As a parent it is hard to watch our children struggle, so get re-assurance from the professionals who are working with your son, so you know that your expectations are realistic for his abilities. Find other parents who have children struggling with similar issues. Talking to others in similar situations or who have professional knowledge of your son’s challenges will help you to feel like you have done everything you can. You can then prioritize your efforts as a parent in supporting him emotionally and unconditionally! Kelly Beins, OT, is a seasoned therapist with more than 23 years ofexperience in occupational therapy. Kelly received her BA in psychology and her bachelor of health sciences in OT from McMaster University in Ontario, Canada. She received her specialty certification in sensory integration in 2005 and has an extensive clinical background combining OT and sensory integration with behavioral health interventions. Kelly is a newly published children’s author of a book series about a young sheep with sensory processing disorder (https://www.otc-frederick.com/ovis-the-sheep/), and she approaches her work with an intuitive, empathic,and playful style while implementing the most current evidence-based interventions available. Kelly also owns and operates her own group private practice in Frederick, MD, where she lives with her husband and two daughters. You may learn more about her practice, books, and unique approach to therapy by visiting her website.